FiberPlus provided labor and materials to make significant upgrades to an existing security system for a National Guard facility. FiberPlus installed four Hirsch Scramble Prox readers, high security access control devices with a keypad that disguises keypad entries but also accepts Common Access Cards used by the military and cards that meet the Federal standard for Personal Identity Verification. The security installation also included an Administrative Enrollment Reader to facilitate entering users into the access control system. A Secure Network Interface Board was also installed in a Model 8 Controller to provide secure encrypted communications with the system computer and an interface with the local unclassified stand-alone network. The Velocity Software was upgraded and a new system server installed. The database for the security system was migrated and updated to the current Microsoft SQL platform. Existing analog cameras were replaced with dual lens Mobotix IP cameras and connected to an OnSSi Surveillance Systems server. Due to distance limitations and difficulty of cabling infrastructure, FiberPlus re-used the existing coaxial cabling and provided Nitek Power-Over-Ethernet converters which allowed the coaxial cable to become a network cable with power and increased the distance limitation to 1640 feet. FiberPlus built a stand alone security network utilizing a 48-port HP switch and category 6 cabling for all servers, monitoring clients, cameras, access controllers, and servers. FiberPlus also provided an updated IDS system to bring a secure facility up to ICD standards. FiberPlus, Inc. (FPI) provided all labor and materials to install a Hirsch Access Control System and American Dynamics Internet Protocol (IP) Closed-Circuit Television (CCTV) camera system. FPI installed cabling from one telecommunications closet to each location receiving Access Control or an IP CCTV camera. FPI utilized the existing rack and wall space and power that was existing. Twelve (12) of the existing Access Control doors were retrofitted with new Personal Identification Verification (PIV) Multiclass Readers. FPI re-utilized the existing locking mechanism and the Request to Exit Sensors on these doors. FPI installed new cabling to these doors to interface with the Hirsch Access Control system. Six (6) new access doors from the elevator lobbies were added to the system. FPI installed cabling to these new doors and added a PIV/Multiclass reader, Request to Exit Motion sensor, Door Status Switch, Push to Exit Button, and interface with the locking device. Fifteen (15) IP CCTV cameras were added to the system and terminated in a 24 port patch panel in the telecommunications closet. These cameras were ceiling mounted dome style cameras with Infrared (IR) illuminators. FPI worked with the owners Information Technology Department to interface to an owner provided POE network switch and on network design and requirements. Access Control Head End is located in the telecommunications closet on the back wall. This equipment required integration to the existing Fire Alarm system for door release in the event of an emergency. FiberPlus, Inc. (FPI) installed a Hirsch Velocity Firmware Upgrade. System design is based on Hirsch Hardware. FPI installed one (1) Secure Network Interface Board (SNIB2) to allow the existing Hirsch system to communicate via clients existing network, permitting clients workstations with the existing Velocity Software loaded on their computers to view the Access Control software. FPI installed the customer’s additional Velocity Client Software on the client furnished workstation to provide the ability to view entire access control transactions. FPI installed ten (10) CCM chips allowing flashing of the existing Hirsh System for upgrading the Velocity Software. FiberPlus designed and installed a comprehensive range of security systems at a DIA facility in Bethesda that included access control, intrusion detection and video surveillance. Access control was based on a Quintron intelligent door control system. The master intelligent controller was installed in the data center. Other intelligent controllers were distributed in the IT closets on the different floors to be closer to the doors they were responsible for. This allows faster troubleshooting in the event of an issue with a specific door control. Installed at each door was a card reader, electric door lock, door contact and request to exit motion detector. Where a magnetic lock was installed, an emergency push button was also installed to be able to release the magnetic lock in case of an emergency. FiberPlus also relocated six access turnstiles. Intrusion detection, using DMP hardware and software, recognizes different access areas requiring different access authority. Balanced magnetic switches for high security were installed on all doors to send an alarm if a door was left open for any length of time. Ceiling motion detectors were also installed inside all secure areas. Video surveillance is achieved by a stand-alone Pelco digital sentry system. Cameras were located both within the building and on outside walls. Alarm output points were integrated into the Pelco system for camera call up features. A video wall installed by FiberPlus in the security control center consists of four 42-inch monitors. 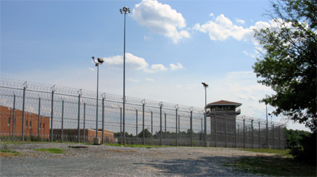 FiberPlus installed an advanced video surveillance system at the Jessup Correctional Institution to allow correction officers to monitor prisoners’ activities for safety and security purposes. The system consisted of more than 500 video cameras connected to 33 digital video recorders through 11 network switches with the video accessed at 15 workstations. Staff training was also included. Interestingly, while the installation was underway, one inmate conducted a vicious attack on another prisoner. The system recorded the attack and prison officials were able to identify the attacker and determine where he was hiding his weapon. FiberPlus, Inc. (FPI) provided all labor and materials to install an Access Control, Intrusion Detection and Closed Circuit Television (CCTV) systems. FPI installed cabling locally inside the Sensitive Compartmented Information Facility (SCIF) from the secure server closet to each device receiving Access Control or Intrusion Detection. Each device received a tamper circuit and is monitored by a central station as a 24 hour zone. A dedicated PC was required inside this space to communicate to the security panel. This allows the customer to add/delete users locally to the system utilizing software instead of the keypad. The System design is based on Kantech Access Control and CCTV and DMP Intrusion Detection Hardware. FiberPlus, Inc. (FPI) provided all labor and materials to install a Kantech Access Control, Internet Protocol (IP) Video Surveillance System and a DMP Intrusion Detection System. FPI installed cabling from the main electrical closet to each door receiving access control or an Intrusion Detection device. FPI installed ANSI frame specific electrical strikes and re-utilized the existing magnetic locks on the front door. The Access Control and IP Cameras are controlled via network utilizing Kantech Corporate Edition Entrapass Software. The DMP intrusion detection system was also controlled via network utilizing DMP Remote Link Software. FPI installed four (4) Scramble/Prox readers that are Personal Identity Verification (PIV) and Common Access Card (CAC) compatible. Upgrade the Velocity Software from 3.1 to 3.5 and replace non-working existing Hirsch computer. FPI installed an Administrative Enrollment Reader for programming of users into the system. FPI also installed a Secure Network Interface Board (SNIB2) encrypted network module to the M8 panel for communication to the existing Hirsch computer and interface with the local unclassified stand alone network. FPI removed existing analog Pelco cameras and utilized Nitek Power-Over-Ethernet (PoE) converters to install dual lens Mobotix Internet Protocol (IP) Cameras and an On-net Surveillance Systems, Inc. (OnSSI) Server. FiberPlus provided Sinclair Broadcasting Group with a new Avigilon HD 84 terabyte Video Recorder, to replace the inadequate surveillance head end recording server, two Avigilon Pan Tilt Zoom (PTZ) cameras on the roof, and three Avigilon multisensor cameras with three megapixel lenses in each camera. FiberPlus recommended the multisensor cameras since they offer unsurpassed image quality and flexibility with multi-directional scene coverage. The 3 lens configuration is equipped with a remote zoom and focus lens; one HD multisensor dome can replace a PTZ or multiple fixed cameras. The multisensor camera features H.264 and motion JPEG compression; Wide Dynamic Range Performance; Power over Ethernet, power input; external microphone and speaker support. Over the next couple of years FiberPlus will be installing new Avigilon cameras to replace the existing cameras and migrating the new cameras to the new Avigilon HD 84 terabyte Video Recorder. FiberPlus provided training to the customer on the system functioning and operations.